WESTERN Sydney forward Nikita Rukavytsya is not quite hitting the panic button ahead of Saturday night's derby against Sydney FC at Pirtek Stadium, despite his team sitting last on the ladder. The Wanderers have surprised many football fans with their slow start to the domestic season - with no wins from their first six games - despite winning the Asian Champions League at the start of this month. 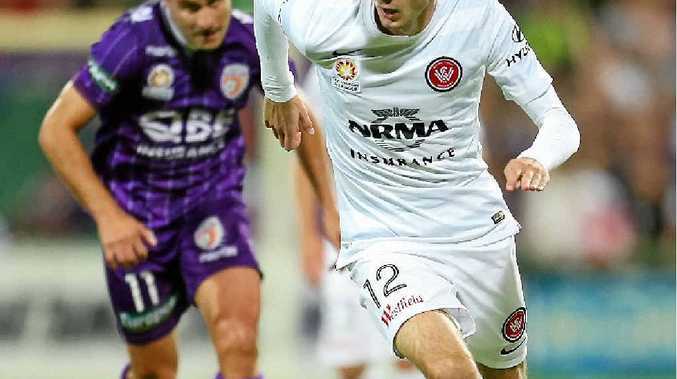 The former Perth Glory star has never played in a Sydney derby, and Saturday's grudge match will have extra spite, with the Wanderers desperate to notch up their first win of the A-League season. The Socceroo is confident his team can claim that crucial first win, after noticing some positive signs in the 1-1 draw against Newcastle last Saturday. "It's another big game for us, we're all looking forward to it," Rukavytsya said. "I think we're improving as a team - each game we're getting better, and I'm sure it won't be long until we start winning. We've created a lot of chances, especially the last few games. Unfortunately the ball doesn't want to go in." Wanderers coach Tony Popovic echoed Rukavytsya's thoughts. "The last two games have been very good (also including a 0-0 draw against Central Coast) - our performances have improved," he said. "We had four away games to start with. There are circumstances and reasons, but there are no excuses - we lost four games in a row. "Everyone's pulled up well from three games in seven days, and we hope to have a fully fit squad."